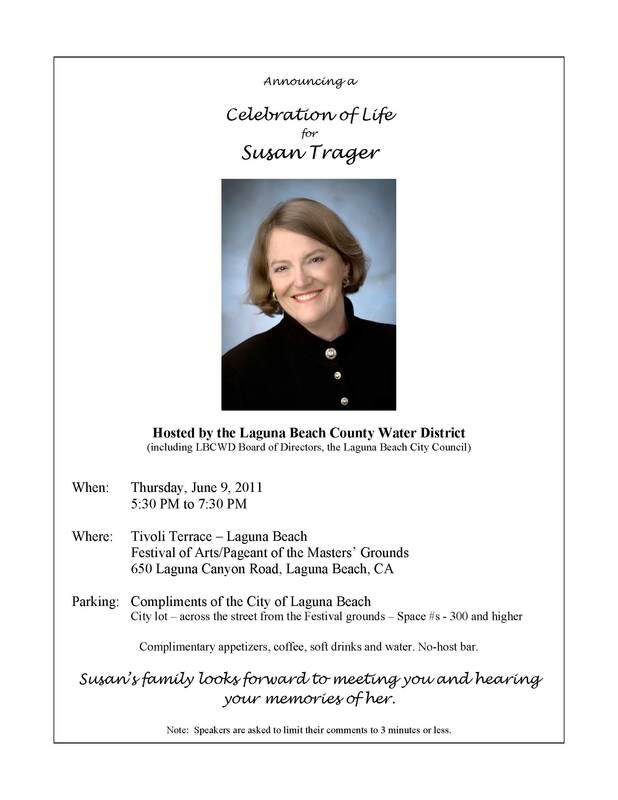 Hosted by the Laguna Beach Water District, a Celebration of Life for Susan Trager Announcement is presented below. Link to the Celebration of Life Announcement Flyer or click on the above image. The following is a transcript of the comments made in the Superior Court of the State of California – for the County of Los Angeles – Department 316 – Hon. Jack Komar presiding. We thank Judge Komar and the attorneys present in the court who acknowledged the passing of one of their colleagues. The following is Resolution 2011-5 adopted during the April Board of Directors Meeting of the San Luis Rey Municipal Water District. We thank Vic Pankey, Bill Pankey and Directors Veysey, Fritz, and Yarger for their kind words of appreciation in remembering their District Legal Counsel of 30 years. The following is a modified page of the Orange County Water Association April 2011 Newsletter Water Matters. The following is a modified page of the Association of California Water Agencies April 2011 Newsletter ACWA News. The following is a modified page of The Little Guild Spring 2011 Newsletter. The Little Guild of West Cornwall, CT is one of Susan’s favorite charities. We thank everyone who made a donation in the name of Susan Trager. The following is a news article commenting on the “brilliant and tenacious water rights attorney Suasn Trager” in the selection of a new General Counsel for the Phelan Pinon Hills Community Services District.